Over the last few days, I've had the pleasure of visiting with an older family friend who has always lived a life entrenched in the foxholes of medicine. To say I learned a lot from our conversations would be a ridiculous understatement. You see, she was born into medicine. Ellie is the daughter of a physician-- the former Dean of a big name medical school. Medical school buildings across ivy covered campuses are adorned with her maiden name. Ellie's childhood was overshadowed by her father's career and accomplishments. And, yet, Ellie did like many of us girls do... she spent her teen years promising she would never, ever marry a man like her father. Yet, after graduating college and nursing school, she did just that. Ellie married a man much like her father... a doctor. So, Ellie, the daughter of a doctor, became the wife of a doctor. 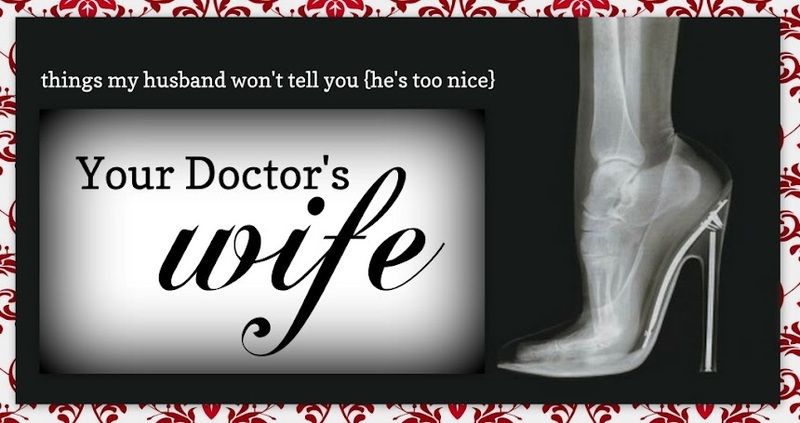 Apparently, she believed being married to a doctor would be different then being the child of a doctor. As time passed, she grew to understand the world of medicine is a consuming world no matter what role you played in it. And while it may be of no surprise to outsiders that one of Ellie's sons felt the urge to continue the physician lineage, she was dismayed and displeased to learn of her child's aspirations to attend medical school. "It's not the life I wanted for my son. It's so demanding and constraining..." she said. Despite her best efforts to talk him down from his jump into the medical school pool, she finally agreed to support his decision... on one count. He had to serve two years in the Peace Corp. Ellie was convinced he would see the world and return home with a different outlook and new appreciation for what our world has to offer outside a hospital or research lab. Two years later, upon his return from the Peace Corp, Ellie's son dove straight into medical school. Now, in the midst of his fellowship, and just a few short months of becoming a newly minted Attending, Ellie realizes sometimes medicine runs deep in the veins of some families...such as her family... and, now, with our own daughter's medical school aspirations, perhaps our family, too. "There's not a darn thing you can do about it. 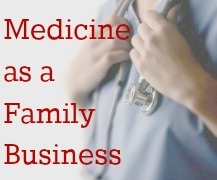 Apparently, medicine has become our family business." I just graduated nursing school and my daughter is already talking about wanting to be a nurse like her mommy. The influence is overwhelming! The funny thing is that when they were little, they didn't want to be a doctor because they said it was too much work! They grow up and change their minds. I just thought her perspective was so interesting. That's for taking it in such an awesome way! I know some people don't want someone to comment on that. :-) And it was only meant to be helpful. It was an awesome perspective and a great post! That's what started thinking while she was talking! This is a great post. I often find myself telling people I will never let my future children go to med school. Who knows if that will be true or not. I guess in the end you just want your kids to be happy and if thats what makes them happy then you go from supportive doctor's wife to supportive doctor's mother. Ha! I thought you *wanted* her to go to med school. Wasn't that SO much better than Beau Hunk? Hopefully, it'll keep her away from Beau Hunk. My grandfather was a doctor, and everyone wonders if one of my kids will follow in his footsteps. His kids and grandkids haven't, but who knows about this next generation. I know of some other doctors who have "doctor" lineage in them and then others who don't. I think it's strange how it seems to run in some families! Thanks for stopping by! I don't think there are any doctors in my family. not on my side, not on my husband's side. hmm. Can't run from fate, eh? In the end I think all you can do is let people explore their own paths and whatever makes them happy, be it medical school or glow-in-the-dark stamp collections! That is just so interesting. We don't have any doctors in our family. I like how you told the story weaving someone else's perspective in with your own. Thank you!!! So happy to be back in with the Yeah Write crowd this week! I have so much respect for people in medicine because I know that I don't have it in me. I truly believe some people were just born to do it. I couldn't agree more with your last line. It's just some families just stay with a specific profession. And doctors and military families are most common case of that. Oh, you're right! While I know plenty of people who have served in the military, I don't know of any military families. But, yes, them too! No doctors in my family, but my peers who are doctors are also children of doctors. Must be in the blood! My husband always says that if he had to choose a different profession it would be medicine. Not sure how he ended up in accounting, but oh well. I often wish I had gone to medical school and wish I knew so clearly at a young age the career I wanted to pursue. It's helpful to hear the other side. Lovely post! It's amazing how careers seem to run in families like that! I wanted to go to med school, but calculus in high school just about killed me, so I went into theatre instead. It turns out, I'm a billion times better with words and communication than math. And that what was so attractive to me about being a doctor was communicating with people, which I can do without their health and well-being in my care. With two kids (one graduating college soon and one heading into Junior year), I have one aspiring to a fun, creative career and the other who just want to be a dive master. I don't know. I want them, as we all do, to be happy with their choices or be able to live with them. Now I would see being in the Peace Corp as feeding the career path. Great story. I think it's interesting to see how so often, kids grow up doing what their parents did, or becoming like their parents--sometimes even when they vow never to do so. Sometimes we just have that in our blood, whether it's the way we see the world, or the jobs we take. Ah, the age old dilemma of trying to control the children's careers...yep, never works. My husband cones from a family of musicians and music teachers. Our son dutifully took violin and Choir for a couple years and was done. The girl, of course turned out to be a dancer and singer and violist who just got admitted to the local performing arts school. There is definitely a nature comonemt as well as nurture.